The Philae lander, part of the European Space Agency's Rosetta mission, captured this image of Comet 67P/Churyumov-Gerasimenko during Philae's descent toward the comet on Nov. 12, 2014, from a distance of about 2 miles (3.2 kilometers). Europe's Rosetta mission pulled off the first-ever soft landing on a comet Wednesday thanks to a lot of great engineering and hard work — along with a healthy dose of luck, mission scientists say. Rosetta's Philae lander successfully touched down on Comet 67P/Churyumov-Gerasimenko early Wednesday morning (Nov. 12), more than 300 million miles (483 million kilometers) from Earth. But Philae's anchoring harpoons didn't fire as planned, and the 220-lb. (100 kilograms) probe bounced off the comet twice before settling onto its icy surface for good. "We were very, very lucky yesterday — so much luck," Stephan Ulamec, Philae lander manager at the DLR German Aerospace Center, said during a news conference Thursday. To put those numbers in perspective: The escape velocity at Earth's surface is about 25,000 mph (40,230 km/h). "I'm actually flabbergasted," he told Space.com. "Somehow, the German gods were looking [over the mission]." Good engineering certainly helped as well. As Philae spiraled down toward the comet, it did have enough kinetic energy to escape back into space, said Mark Hofstadter, deputy principal investigator for MIRO (Microwave Instrument on the Rosetta Orbiter). However, shock absorbers in Philae's legs absorbed and converted to heat much of that energy when the probe hit the surface the first time, he noted. "Plus, a little energy was absorbed by the surface the lander hit (maybe crushing some rocks)," Hofstadter, who's based at NASA's Jet Propulsion Laboratory in Pasadena, California, told Space.com via email. "So knowing that even a tiny amount of energy was dissipated means that the lander would not have enough energy to escape again." Indeed, the Philae team built some redundancy into the lander, allowing it to cope with a variety of different situations and parameters on Comet 67P, Ulamec said. "The harpoons did not work, but the landing gear worked very nicely," he said. Schultz observed that the Rosetta mission was conceived and developed more than 20 years ago, when researchers knew far less about comets than they do today. "It's remarkable that this has worked so well," he said. "And this is why it's always worth it to dare, and to explore. That's the big lesson for me." With the probe in its current precarious position, the mission team is hesistant to try firing the anchoring harpoons again or use Philae's drilling instrument, which can collect samples from more than 8 inches (20 centimeters) beneath the comet's surface, Ulamec said. But Philae is already well into its "first science sequence" phase, or FSS, using its 10 different instruments to get a first taste of the comet. 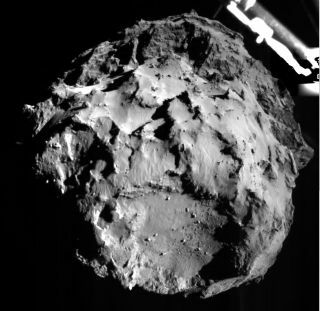 The FSS will last until Philae's primary batteries run out — perhaps two to three days after touchdown, mission officials have said. The plan also calls for Philae to keep studying Comet 67P over the long term, using batteries that will be recharged by solar cells aboard the lander. This second phase was envisioned to last a maximum of three months or so, but expectations may have to be recalibrated downward after the double-bounce landing; Philae is only getting about 1.5 hours of sunlight per day in its current location, while the intended landing site offered 6 to 7 hours per day, the lander's handlers say. Regardless, Philae should still manage to collect a great deal of interesting data, mission team members say. The lander's scientific gear is designed to study the composition and structure of Comet 67P in great detail. For example, one instrument employs radio waves to probe the interior of the comet's nucleus, while another identifies complex organic molecules on the surface. "This is real comet geology now," Schultz said. "I think it's going to be a spectacular mission." Comets are icy remnants left over from the solar system's formation 4.6 billion years ago, so observations made by Philae and the Rosetta mothership should shed light on the conditions prevalent when Earth and the other planets were taking shape, mission officials have said.